...that the High Prophet of Truth's birth name is "Ord Casto"? ...that the center of Forerunner governance was a massive structure known as the Capital? ...that a CSO-class supercarrier is almost 18 miles long? Were you looking for Infection Form? Infection in Halo 5: Guardians. 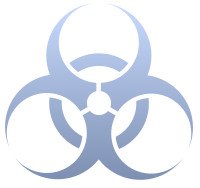 Infection is a multiplayer gametype in Halo 3, Halo: Reach, Halo 2: Anniversary, and Halo 5: Guardians. It is the official Zombie mode, modelled after zombie mode's popularity as a custom game in Halo 2. In Halo 4, the gametype was tweaked and renamed Flood. Players in Infection matches are split into two teams: the Survivors and the Zombies. When a survivor dies, they switch to the zombie team. A survivor's goal is to remain alive (i.e. "uninfected") until the end of the round, while a zombie's goal is to kill (infect) as many survivors as possible. When only one survivor remains, that survivor becomes the "Last Man Standing." The Last Man Standing can be given unique player traits; typically, these include a waypoint revealing their location to zombies, making survival an extreme challenge. The players who start a round as zombies are Alpha Zombies. The number of Alpha Zombies can be changed in the gametype options, and Alpha Zombies can be given unique player traits to distinguish them from standard zombies. Typically, the zombies have melee weapons at their disposal and are capable of killing survivors in a single blow. Survivors are given short- and medium-range firearms. Infection Spree - Infect five humans without dying. Mmmm... Brains - Infect ten humans without dying. Infection was available on-disc from launch day, but did not appear in Matchmaking until October 31, 2007, when a special Halloween playlist was introduced. This playlist permitted up to 13 players (it being an "unlucky" number) to play Infection; it was wildly popular and eventually became a frequently-recurring Double EXP Weekend playlist: Living Dead. Living Dead was ranked when it appeared on Halloween, and social on other occasions It offered a number of Infection gametypes, including "Save One Bullet" and "Brains." Infection games have also appeared in other Double EXP playlists such as Turkey Day, the 2008 Thanksgiving weekend playlist. Human players holding a position in Infection. Halo: Reach introduced the Safe Havens feature; maps had to be compatible with Safe Havens in order to support any Infection game variant, even when the Havens feature was disabled. Reach also introduced the "rebalancing" feature: if a zombie quit a match, a survivor would be forcibly converted to a zombie. Reach did not offer the Alpha Zombie feature on launch; it also did not offer the "Next Zombie" option due to technical limitations. While Zombie Traits could be configured as normal, zombies' starting loadouts were harder to find: you had to edit the "Elite Loadouts" normally used for Invasion. In the default Infection settings, zombies had the Evade armor ability, a higher movement speed, and lower gravity, which allowed them to rapidly approach survivors so long as they did not jump; conversely, they had no shields, making them constantly vulnerable to headshots. Survivors spawned with both shotguns and magnums, but weapon pickup was disabled, leaving them unable to acquire more ammo; even when they ran out of ammo, they could sometimes survive using sword block, a game mechanic unique to Reach. The default Safe Havens settings differed only slightly from Infection: survivors' damage output was reduced by half when outside of a haven, and survivors were granted invulnerability and standard damage output while inside of a haven. In May 2011, Bungie released an Infection game variant that implemented the Alpha Zombie feature; this variant's default settings gave Alpha Zombies unlimited sprint and forced color (red armor). Halo: Reach offered Living Dead as a standard playlist available from launch day. Changes to Infection's settings and gametype script were distributed through this playlist; players who wanted to experiment with Alpha Zombies had to play the variant in Matchmaking and then save it from their Temporary History. Small changes were made to Infection's settings over time; for example, zombies had their gravity increased to normal and their jump height increased, to allow them to jump higher without being "floaty" and excessively vulnerable in mid-air. For the most part, though, Living Dead maintenance focused on patching the most egregious exploits in the playlist's maps, the overwhelming majority of which were not designed or significantly customized with Infection gameplay in mind. If players were given limited lives and all zombies ran out of lives, the round wouldn't end properly. Infection's special round-end conditions (all survivors dead) still functioned, but otherwise, Infection was technically an FFA gametype and so used FFA round-end conditions. As such, in variants with limited lives, a round would only end if all zombies and all but one survivor ran out of lives. This meant that many popular Custom Games, such as Duck Hunt, had to be built "backwards," with the hunter implemented as a lone survivor and the prey as zombies. A race condition would often occur when a survivor and a zombie traded kills in close quarters: the kills would sometimes register after the survivor changed teams, leading the game to count one of the kills as a betrayal. In many cases, the killed survivor would be given the option to boot, and vengeful players would often make use of that option. This is why Betrayal Booting was removed from the Living Dead playlist. It is not known how the later removal of Friendly Fire from the playlist affected this bug. A player's team assignment would often desynch when they joined games in progress. New players would spawn as survivors, but they would appear as enemies to fellow survivors: the players already present would see the new player's gamertag in red and even gain aim assist on them. Zombies used a unique Flood-infected player model, similar to Halo 4's Flood. In Halo 2: Anniversary, the Flood infection was mostly contained within a Spartan's armor, but Spartans' heads were severely mutilated by Pod infectors. Halo 2: Anniversary offered a unique Flood Energy Sword with a red hue, which was available in Forge and in game variant options. This weapon was designed specifically for use in Infection, and zombies were equipped with it by default. Infection offered unique settings for variants such as Cadre and Flight. Cadre allowed survivors to receive special player traits as long as they remained near each other, while Flight tasked survivors with carrying a bomb around the map and arming it at specific locations. 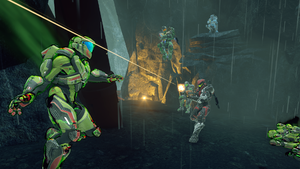 Infection was added to Halo 5: Guardians as part of the Memories of Reach update. Spartans start with a Shotgun and Assault Rifle with low ammunition. Other weapons can be found in the field. Zombies use Energy Swords with a green tint and have a Pestilence effect. Alpha Zombies now have partial Active Camouflage and do not appear on the motion sensor. Both Spartans and Zombies can use boost thrusters, but Zombies cannot sprint. If you are building an Infection game, try to make it balanced. Consider giving the zombies 200% health and no shields, with a slightly higher speed and jump; in turn, try giving the survivors shotguns and pistols with limited ammo. When forging maps, be careful to make sure that survivors can't camp in a room with a single entrance; try and force the survivors to work together to guard a location. It's often fun to barricade doors with movable or breakable items, such as barrels and pallets, when designing maps. Survivors can work together to bait zombies into a trap, to earn more kills. Survivors can hole up in an easily-defended location, wait for zombie attacks to lull, and send out one player to serve as bait. The bait player would try to lure zombies into the base, where the zombies would be killed by overwhelming force. In Halo 3, a survivor could escape infection and respawn elsewhere if they committed suicide while under attack. In Halo: Reach, however, players that commit suicide will be infected. Survivors should try to avoid using melee weapons against zombies unless they're very skilled with those weapons; zombies will also have melee weapons, so the odds of survival are generally about even. Zombies can afford to die; survivors cannot. Conserving ammunition is key in all Infection game types. Most players tend to aim for the one spot where it will do the most damage, the head. However, even though zombies are vulnerable to headshots in most gametypes, the head is a small target and can be difficult to hit at range. Headshots use less ammo than body shots, but body shots use less ammo than repeatedly missing the head. Never use Armor Lock in Infection. This only makes it easier for the zombies to swarm around you and wait until you pop back up for the kill. Try to avoid using attached turrets where possible, as they leave you unable to move and exposed from behind and to the sides. Only use turrets if you are sure that your team can hold your flanks. It is common practice for survivors to camp at an exploitable part of the map, where they pick off zombies with relative ease. Though some of these areas have been eliminated from Matchmaking through updates, many remain that are simply normal areas of the map that are easy to reach but unbelievably hard to conquer when faced with a strong team of survivors. Survivors are not able to pick up ammo, forcing them to pace their shots. In some cases, the last player gets infected before time runs out due to lack of ammo. Halo 3's Mythic Map Pack introduced Achievements specifically for Infection: Delicious Brains was awarded to zombies who infected two survivors during a round, and Zombie Repeller was awarded to survivors who killed two zombies during a round. In Halo: Reach Custom Games, the Safe Havens feature was used to create Infection maps that put players on a linear progression: survivors had to traverse a linear path, such as a series of city streets, and reach a Haven placed at the end of the map to win; zombies spawned at a central hub and could use teleporters to access any part of the path. This gameplay was enforced by only crediting survivors for kills scored from inside of a Safe Haven. It was common for settings to be tweaked so that survivors took two or three hits to kill, but did not regenerate their shields or health without the use of a health pack. 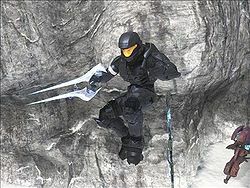 It is possible for a survivor to acquire an Energy Sword in Halo: Reach, as seen here. For this to happen, a host migration must occur right as a survivor is infected and respawns as a zombie. When the game starts again, there's a chance that the player will turn back into a survivor, but will keep the zombie loadout. An infected player in Halo 5: Guardians. The HUD of an infected player in Halo 5: Guardians.